For the 2019 Trump-Kim summit, see 2019 North Korea–United States Hanoi Summit. “Singapore summit” redirects here. For the 2015 summit between leaders of mainland China and Taiwan, see Ma–Xi meeting. Immediately following the summit, President Trump announced that the U.S.military would discontinue “provocative” joint military exercises with South Korea, and stated that he wished to bring the U.S. soldiers back home at some point, but he reinforced that it was not part of the Singapore equation. On August 1, 2018, the U.S. Senate passed the military budget bill for 2019, forbidding funding the reduction of active USFK personnel below 22,000; significant removal of US forces is considered a non-negotiable item in denuclearization talks with the North.The 2018 North Korea–United States Singapore Summit, officially the DPRK–USA Singapore Summit, or commonly known as Singapore Summit, was a summit meeting between North Korean Chairman Kim Jong-un and U.S. President Donald Trump, held at the Capella Hotel, Sentosa, Singapore. This was the first-ever meeting between leaders of North Korea and United States. They signed a joint statement, agreeing to security guarantees for North Korea, new peaceful relations, the denuclearization of the Korean Peninsula, recovery of soldiers’ remains, and follow-up negotiations between high-level officials. Both leaders also met separately with Singaporean Prime Minister Lee Hsien Loong. After a period of heightened conflict that included North Korea successfully testing what it claims was its first hydrogen bomb and the Hwasong-15intercontinental ballistic missile (ICBM) in late 2017, tensions began to de-escalate after Kim Jong-un announced his desire to send athletes to the 2018 Winter Olympics being held in South Korea. During the games, Kim proposed talks with South Korea to plan an inter-Korean summit. On March 8, the South Korean delegation returned from the talks and traveled to the United States to deliver an invitation by Kim Jong-un to Donald Trump for a meeting. High-level exchanges between the two sides then took place, including a visit by then-CIA Director Mike Pompeo to Pyongyang and a visit by Kim Yong-chol, Vice Chairman of the Workers’ Party of Korea, to the White House. Both sides threatened to cancel the summit after a round of joint military exercises by the U.S. and South Korea, with Trump even delivering a formal letter to Kim to call off the meeting; however, the two sides eventually agreed to meet. Eight months later and more than 2,200km further north, Vietnam’s capital Hanoi is gearing up to host the second encounter between the leaders of North Korea and the United States following their unprecedented summit last year in Singapore. Korea has been divided since 1945. The Korean War of 1950–1953 ended with an armistice agreement but not a peace settlement. A sporadic conflict has continued, with American troops remaining in the South as part of a mutual defense treaty. The North began building a nuclear reactor in 1963, and it began a nuclear weapons program in the 1980s. North Korea first committed to denuclearization in 1992 in the Joint Declaration of the Denuclearization of the Korean Peninsula. In a speech authored by David Frum, President George W. Bush referred to North Korea as part of an “axis of evil” during his 2002 State of the Union address, but in the 2005 Joint Statement of the Fourth Round of the Six-Party Talks, North Korea reaffirmed the 1992 Joint Declaration and the goal of verifiable denuclearization of the Korean Peninsula. In 2008, North Korea voluntarily gave information on its nuclear program in exchange for sanction relief, and they were taken off the State Sponsors of Terrorismlist. Despite this, nuclear inspectors were barred from surveying any North Korean weapons facilities. The Obama administration had a policy of “strategic patience”, in which perceived North Korean provocations would not be “rewarded” with presidential attention or the sending of high-level envoys but instead be punished with sanctions and greater military coordination with South Korea and Japan. More nuclear tests were conducted in the succeeding years, and the 2010 bombardment of Yeonpyeong markedly raised tensions between North Korea and South Korea. The escalation of North Korea’s nuclear program advanced particularly under the rule of Kim Jong-un, who became the leader in December 2011, after his father Kim Jong-il died. Donald Trump was elected US President in 2016 with a position of opposition to Barack Obama‘s policy of “strategic patience” towards North Korea. While advocating a tough stance, he also expressed openness to dialogue, saying he would be prepared to “eat a hamburger” with Kim. He put himself at odds with military allies, saying that it would be better if South Korea and Japan protect themselves. In return, a pro-North Korean website, DPRK Today, described him as a “wise politician”. The editorial suggested that Trump might make the slogan “Yankee go home” a reality. In 2017, Moon Jae-inwas elected President of South Korea with a promise to return to the Sunshine Policy of friendly relations with the North. During a period of heightened tensions with the United States, North Korea successfully tested its first intercontinental ballistic missile (ICBM), named Hwasong-14, in July 2017. In response to heightened North Korean rhetoric, Trump warned that any North Korean attack “will be met with fire, fury and frankly power, the likes of which the world has never seen before”. In response, North Korea announced that it was considering a missile test in which the missiles would land near the US territory of Guam. North Korea tested what some sources argued may have been its first hydrogen bomb on September 3. The test was internationally condemned, and further economic sanctions were put on North Korea. The United States also added North Korea back to its State Sponsors of Terrorism list after nine years. On November 28, North Korea launched the Hwasong-15, which, according to analysts, would be capable of reaching anywhere in the United States. The United Nations responded by placing further sanctionson the country. After North Korea claimed that the missile was capable of “carrying [a] super-heavy [nuclear] warhead and hitting the whole mainland of the U.S.”, Kim-Jong-Un announced that they had “finally realized the great historic cause of completing the state nuclear force”, putting them in a position of strength to push the United States into talks. In his New Year address for 2018, North Korean chairman Kim Jong-un celebrated completing their nuclear capabilities and proposed talks for sending a delegation to the upcoming Winter Olympics in South Korea. In January a false missile alertalarmed Hawaii. The Seoul–Pyongyang hotline was reopened after almost two years. North Korea sent an unprecedented high-level delegation, headed by Kim Yo-jong, sister of Kim Jong-un, and Chairman of the Presidium of the Supreme People’s Assembly Kim Yong-nam, and including performers like the Samjiyon Orchestra. The delegation passed on an invitation to President Moon to visit North Korea. The United States was represented by Vice President Mike Pence. After arriving late to a dinner hosted by President Moon, he was asked to greet the other dignitaries, but he shook hands with everyone except Kim Yong-nam and left early. North and South Korean athletes marched together in the Olympics opening ceremony and fielded a united women’s ice hockey team. Chung Eui-yong (left), the South Korean national security chief, and Kim Jong-un meeting in Pyongyang on March 5, 2018. Kim is holding a letter from President Moon Jae-in arranging for direct peace talks. On March 5, 2018, South Korea‘s special delegation agreed to hold the third inter-Korean summit at Inter-Korean Peace House in Panmunjom on April 27, 2018. On March 6, after returning to South Korea, the national security adviser, Chung Eui-yong, and National Information Director Suh Hoon traveled to the United States on March 8 to report to Trump about the upcoming inter-Korean summit and relayed to President Trump the North Korean chairman Kim Jong-un’s invitation. Trump endorsed the North Korea–United States summit about an hour after receiving the report. The South Korean National Security Adviser (SKNS), Mr. Jeong briefed the public that the North Korea–United States summit would be held sometime in May 2018. The White House announced that the UN Sanctions would remain in place until an agreement between the United States and North Korea is reached. On March 6, Sarah Sanders said that the White House would need to see “concrete and verifiable steps” toward the denuclearization of North Korea before Trump would meet with Kim Jong-un. Later that day, an unidentified Trump official told The Wall Street Journal that Trump had still accepted Kim Jong-un’s invitation. South Korea’s national security adviser Chung Eui-yong visited China on March 12 to meet with the Chinese leader, Xi Jinping, of the foreign officials and report on the planned inter-Korean summit as well as the North Korea-United States summit and asked their advice. Russia on March 14, 2018, for explaining North Korea and the United States Visit Summary, seeking guidance for upcoming 2018 inter-Korean summit. National Information Director Suh Hoon visited Japan and had a consultation with Prime Minister Shinzō Abeincluding the foreign officials about the denuclearization and Permanent Peace on the Korean Peninsula. South Korea’s foreign ministry announced on March 18 that selected informal delegations from North Korea, South Korea, and the US would meet for denuclearization discussions in April in Vantaa, Finland. (This type of discussions, as held previously, had sometimes been referred to as track-2 talks.) According to South Korea’s Yonhap news, Choe Kang-il, a deputy director general for North American affairs at North Korea’s foreign ministry, would also attend the event, which Yonhaptermed “track-1.5 talks”. Chinese leader Xi Jinpingmet Kim in China in March and May 2018, the North Korean leader’s first known international visits. North Korea’s supreme leader Kim was in Beijing on March 25–28, 2018, arriving by special train for talks with China’s paramount leader Xi Jinping, Kim’s first known out-of-country excursion since taking power six years previously. China stated that North Korea was “committed to denuclearization” and willing to hold a summit with the United States. It was organized by the invitation of Xi. During the meeting between two leaders, Kim officially invited Xi to the North Korean capital Pyongyang when it was convenient in his schedule, and Xi accepted the invitation. Xi urged Kim to strengthen the strategic and diplomatic future partnership between China and North Korea. Kim stressed to Xi that North Korea and China are communist countries and that there are many ways to cooperate in various aspects in the future. Kim and Xi met again on May 7, 2018, in the city of Dalian, China. According to North Korea’s state media Korean Central News Agency (KCNA), Kim led a meeting of the ruling Workers’ Party of Korea’s political bureau on April 9, 2018, where he spoke about the planned summit with Trump for the first time. Establishing official diplomatic ties between North Korea and the United States. Although North Korea was previously expected to request the withdrawal of United States Forces Korea (USFK) from South Korea, North Korea publicized they would embrace the continuous deployment of 25,000 USFK troops in South Korea as long as the security of North Korea is guaranteed. Kim and President of South KoreaMoon Jae-in shake hands in greeting, in an initiating gesture for the April 2018 inter-Korean summit. At an inter-Korean summit on April 27, 2018, held at the Peace House in Panmunjom, the leaders of North and South Korea agreed to formally end the Korean War before the end of the year and confirmed the goal of a nuclear-free Korean Peninsula through denuclearization. President Donald J. Trump and First Lady Melania Trump welcome home three American returnees from North Korea. On May 10, 2018, three Americans held by North Korea were released following negotiations between the Trump administration and the North Korean regime. Some have speculated that their release was part of an attempt of the regime to motivate the US to continue the negotiations and perhaps ease the pressure upon the North Koreans. Nevertheless, their release has managed to ease the tensions between the Trump administration and the North Korean regime, enabling both sides to proceed to further negotiations, possibly leading to the 2018 North Korea–United States summit. The three Americans Kim Dong-chul, Kim Sang-duk, and Kim Hak-song left North Korea accompanied by Secretary of State Mike Pompeo and were greeted by the president and the first lady upon their landing on US soil at Joint Base Andrews in Maryland. American Vice President Mike Pence said on May 21, 2018, that “this will only end like the Libyan model ended if Kim Jong-un doesn’t make a deal” to “dismantle his nuclear weapons program”. Trump had made similar remarks on May 17, as he described that Libya’s fate is “what will take place if we don’t make a deal”. These comments were in reference to the killing of Libyan leader Muammar Gaddafi after military intervention by Americans and Europeans in 2011. After a NATO airstrike prevented Gaddafi’s escape, the Libyan rebels captured, beat up, sodomized, and executed Gaddafi. However, Libya under Gaddafi had already in 2003 voluntarily ended its nuclear weapons program and complied with conditions set by Western powers. As a result, North Korean vice foreign minister Choe Son-hui called Pence’s remarks “ignorant and stupid” and threatened a “nuclear-to-nuclear showdown”. South Korean President Moon was left “very perplexed” by Trump’s cancellation, while the South Korean minister in charge of inter-Korean affairs Cho Myoung-gyon said that North Korea “remains sincere” on “efforts on denuclearization and peace building”. In response to Trump’s cancellation, North Korean vice foreign minister Kim Kye-gwan expressed his country’s “willingness to sit down face-to-face with the US and resolve issues anytime and in any format”, being “open-minded in giving time and opportunity to the US” for the “peace and stability for the world and the Korean Peninsula”. Trump’s cancellation had come on the day North Korea had detonated explosives at its only known nuclear test site, at Punggye-ri in front of international journalists; North Korea claimed that this would have demolished the test site. On May 25, however, Trump announced that the summit could resume as scheduled following a “very nice statement” he received from North Korea and that talks were now resuming. The following day, White House Press Secretary Sarah Sanders confirmed in a statement that a “pre-advance team for Singapore will leave as scheduled in order to prepare the summit should take place”. The team, consisting of about thirty staffers from both the White House and State Department, met with North Korean counterparts over Memorial Day weekend. Kim Yong-chol met with Pompeo on May 30, and with Trump on June 1. On May 30, North Korean general Kim Yong-chol arrived in New York City to meet with US Secretary of State Mike Pompeo. Negotiations between Kim and Pompeo continued the next day, and Pompeo later stated at a press conference that “good progress” had been made. Kim Yong-chol, who is the Vice Chair of Central Committee of the Workers’ Party of Korea, is the highest-ranking North Korean official to visit the US since 2000 (when Jo Myong-rok met with US President Bill Clinton in Washington, D.C.). On June 1, Trump announced the summit would resume as scheduled for June 12 after he met Kim Yong-chol at the White House. Kim Yong-chol delivered a letter from Kim Jong-un to Trump, of which Trump first told reporters that it was “a very nice” and “a very interesting letter”, yet eight minutes later said “I haven’t seen the letter yet. I purposely didn’t open the letter”. Moon Jae-in met with Trump on May 22. On May 22, 2018, South Korea President Moon Jae-in visited the United States to meet President Trump, to promote Trump-Kim summit progress, and to coordinate the two countries’ common strategy regarding the upcoming summit, following harsh rhetoric from North Korea towards Washington. North Korea shut down its Punggye-ri nuclear test site on 23 May (Thursday) to demonstrate its commitment to denuclearization. The South Korean government welcomed the DPRK‘s unilateral nuclear concession to help facilitate a broader agreement with the United States to completely end its nuclear weapons program. On June 3, North Korea’s Chairman Kim Jong-un replaced three generals of highest military officers who are responsible for the development of North Korea’s ICBMnuclear weapons. Two leaders of North and South Koreas exchanged their opinions about the issues and solutions for the Trump-Kim summit as Trump abruptly cancelled the upcoming US-North Korea summit on 12 June. The principal agenda of the meeting was trying to get U.S. summit back on track and keep progressing the denuclearization talks. The second 2018 summit was established by Kim Jung-un’s suggestion within a whirlwind 24 hour notice, but Moon Jae-in accepted Kim’s invitation as per the critical nuclear agenda between North and South Korea. Moon Jae-in had expressed his belief, and he discussed with Kim Jong Un about Kim’s willingness to join nuclear interventions with Trump. Both leaders also agreed to accelerate the implementation of the Panmunjom Declaration and meet again at “anytime and anyplace” without formality. During President Donald Trump‘s meeting with North Korea envoy, the former spy chief Kim Yong-chol at the White House, Trump said that he would choose the “denuclearization process” in North Korea. The nuclear warheads and the ICBM nuclear missiles completed in North Korea could be transferred outside of North Korea and economic sanctions on North Korea could be partly alleviated. The next step would be comprehensive inspections on North Korea‘s nuclear facilities and nuclear ICBM weapons program by IAEA. On July 7, 2018, U.S. Secretary of State Mike Pompeo, Japanese Foreign Minister Taro Kono and South Korean Foreign Minister Kang Kyung Wha met in Tokyo, where they reaffirmed their unity in urging North Korea to denuclearize as promised. The ministers stressed the need to call on North Korea to take concrete steps toward denuclearization and to keep existing U.N. economic sanctions in place. Ten days later, Donald Trump said there is “no time limit” for North Korea to denuclearise and that there is no need to rush the process. On June 3, a “special event area” was declared by the Ministry of Home Affairs around the area surrounding the Shangri-La Hotel Singapore and stringent security measures will be in force from June 10–14. On the same day, a smaller segment within the “special event area” was declared a “special zone” by the Singapore Police Force where enhanced police powers will be in effect during the same period. On June 5, the Ministry of Home Affairs (Singapore) declared the whole of Sentosa Island, including waters off its south-west beaches, a “special event area” from June 10–14. The summit venue Capella Singaporesits on the “special event area”. The government also issued an order exempting four bulletproof and bombproof vehicles from certain traffic rules for the purposes of conveying “non-citizen” individuals for the summit from June 5–30. The F1 Pit Building has also been designated as the summit’s International Media Centre for international journalists to cover the summit and will be operated from 10 am on June 10 to 10 pm on June 13. On June 6, Singapore’s aviation authorities announced that temporary airspace restrictions will be put in place for parts of June 11, 12 and 13. Aircraft arriving at Singapore Changi Airport will be required to reduce speed and some restrictions are placed on runway use. Aviators are also informed to stay away from Paya Lebar Air Base, a facility used by US Presidents on their previous visits to Singapore. The Singapore Mint also released three commemorative medallions to mark the summit. They are available in gold proof, silver proof, and nickel plated zinc proof. On June 9, the Singapore Police Force and the Land Transport Authority announced that security measures, such as road closures and security checks, will kick in. Some bus stops in the Tanglin area will be skipped and security checks will be conducted along stretches of roads around the Shangri-La Hotel Singapore and the St Regis Hotel Singapore, the two hotels Trump and Kim are believed to be staying in. Bag searches and other security checks may be conducted for visitors entering Sentosa Island. On June 11, Singapore’s Minister for Foreign Affairs Vivian Balakrishnan announced that the Singapore government would be paying for the North Korean contingent’s hotel bill, forming part of the total US$20 million expenditure for the summit, as it was “hospitality that we would have offered them”. On June 25, the Ministry of Foreign Affairs (MFA) announced that the summit cost S$16.3 million, lower than the initial planned cost mentioned by Prime Minister Lee Hsien Loong. In preparation for the summit, Singapore’s Minister for Foreign Affairs Vivian Balakrishnan visited the United States on a working visit and met with the United States Secretary of State Mike Pompeo and National Security Advisor John R. Bolton. He visited North Korea and met with North Korea’s Minister of Foreign Affairs Ri Yong-ho and Chairman of the Presidium of the Supreme People’s Assembly Kim Yong-nam to further lay the groundwork for the Trump-Kim summit. Singapore Prime Minister Lee Hsien Loong visited the summit’s International Media Centre on June 10 when it opened. At a media conference, Lee mentioned that the summit cost S$20 million, with security costs taking up S$10 million and the setting up of the International Media Centre costing S$5 million, but it is a cost that Singapore is “willing to pay”. The media center opened to journalists and they were given customized items, including a bottle of water, a fan, and a notebook. The center hosted more than 2500 local and international journalists. On March 31 and possibly also April 1, then-CIA director Mike Pompeo had secretly met with Kim in Pyongyang to lay the groundwork for the summit, including their discussing possible venues. On April 17, on the day of a meeting at Mar-a-Lagoof Trump with Prime Minister of Japan Shinzō Abe, sources revealed to reporters the identities involved in the discussions in Pyongyang. Trump administration sources said on April 28 that the meeting would be held in either Singapore or Mongolia. On April 30, Trump remarked on a possibility the Peace House and inter-Korean House of Freedom (Joint Security Area) in Panmunjom would serve as venues. Trump believes that Panmunjom in DMZwould be the reasonable location for the meeting to remove nuclear weapons and to sign the preparatory peace treaty on the Korean peninsula. The inter-Korean Peace House was where the 2018 inter-Korean summit was held earlier in April. Singapore was the site of a recent China–Taiwan summit. Mongolia has sponsored a number of talks in recent years involving regional and international players and is accessible by train from North Korea. On April 30, Trump confirmed that Singapore, the Peace House and the inter-Korean House of Freedom were under consideration. American officials said the most likely mutually-agreed-upon choice of venue would be in Southeast Asia or Europe, especially from among the choices of Singapore, Vietnam, Thailand, Switzerland (where Kim and his two siblings had some schooling), or Sweden (whose embassy acts as intermediary for Americans traveling in North Korea). Another possible location of the summit would be Ulaanbaatar, Mongolia. Additionally proposed venues included Pyongyang, North Korea (favored by Kim); the Inter-Korean Peace House in Panmunjom near the boundary of the Demilitarized Zone between North and South Korea (site for the April 27, 2018 inter-Korean summit; a site possibly favored by Kim for the summit with the US as well); the Russian port city of Vladivostok (accessible to Kim by land or sea and nearby Vyatskoye, Kim’s predecessor and father Kim Jong-il‘s February 16, 1941 birthplace); a Chinese city such as Shenyang, Changchun, or Beijing (favored by China); Seoul or South Korea‘s Jeju Island; or, aboard a US ship in international waters. North Korea’s Vice Chairman Kim Yong-chol delivers a personal letter from Kim to Trump, in the White House Oval Office on June 1, 2018. CNN reported on May 9 that Singapore will be hosting the meeting on June 12. As per CNBC, a White House official said Singapore was chosen as it has diplomatic relations with both United States and North Korea, and was one of the few countries that have relationships with both countries. Trump confirmed the location on May 10 and announced that the summit is set for June 12. At 4,700 kilometres (2,900 mi) from Pyongyang’s Sunan airport, Singapore is easily within the range of Kim’s Soviet-made Il-62M aircraft. Local media reported that the most likely choice of venue would be the Shangri-La Hotel Singapore near Orchard Road, known for hosting the annual Shangri-La Dialogue and the 2015 Ma–Xi meeting. A South Korean report also cited The Istana, the official residence of the President of Singapore, as a possible venue to host the summit. Singapore’s Ministry of Foreign Affairs further provided information on the summit stating that “Singapore is pleased to host the meeting between President of the United States Donald J. Trump and Democratic People’s Republic of Korea State Affairs Commission Chairman Kim Jong-un on 12 June 2018. We hope this meeting will advance prospects for peace in the Korean Peninsula”. However, the ministry did not provide any details on the venue and the arrangements. Following Trump’s renewed commitment to the summit on June 1, Singapore’s Defence Minister Ng Eng Hen welcomed the move and stated that Singapore would cover some of the costs of the summit. Advance team members of the American and North Korean delegations that were meeting in Singapore in prior weeks were believed to have been staying in Capella Singapore on Sentosa, and the Fullerton Hotel Singapore in the city’s Downtown Core respectively, both of which were additional venue options for the summit. The White House announced on June 4 that the meeting will take place at 9:00 am (SGT), and confirmed the next day that Capella Singapore will be the venue for the June 12 summit. The US clarified that they would not pay for North Korea’s officials’ accommodation. They also affirmed that they would talk with the South Korean and Japanese governments if asked about the possible declaration of the end of the Korean War during the summit. On June 9, 2018, at a press conference at the G7 Summit in Quebec, Trump estimated that the interpersonal chemistrybetween him and Leader Kim Jong-un would be a deciding factor in the success of the Summit in Singapore and that this would be a one-time chance for North Korea to strike a deal. US President Donald Trump left the 44th G7 summit around four hours earlier than scheduled and departed directly for Singapore. He reportedly viewed the G7 summit as a “distraction” from his summit with Kim. Trump landed at Singapore’s Paya Lebar Airbase at 20:20 local time and was welcomed by Singapore’s Minister for Foreign Affairs Vivian Balakrishnan. A US Air Force Boeing C-17 Globemaster IIItransport plane was already at the air base ahead of his arrival. Trump stayed at the Shangri-La Hotel Singapore, which has also hosted previous US Presidents. North Korean chairman Kim Jong-un landed at Singapore Changi Airport on Sunday at about 14:35 local time and was welcomed by Singapore’s Minister for Foreign Affairs Vivian Balakrishnan and Minister for Education Ong Ye Kung. Kim flew to Singapore on a Boeing 747 operated by Air China, a plane used by the highest echelons of the Chinese leadership. According to media reports, a cargo plane, an Air Koryo Ilyushin Il-76, containing food items and other perishables landed in Singapore from North Korea before Kim’s plane landed. Chiller trucks ferried them to the St. Regis Hotel Singapore where Kim stayed. A third plane from North Korea, an Air Koryo Ilyushin Il-62, landed shortly afterward; Kim’s sister and Vice Director of the Propaganda and Agitation Department, Kim Yo-jong, was believed to be on board. Both Trump and Kim have met separately with Singapore Prime Minister Lee Hsien Loong. Kim met Lee on Sunday evening at The Istana. Trump met Lee on Monday afternoon, also at The Istana. He was accorded a bilateral meeting, followed by a working lunch and then an expanded bilateral meeting. During the meeting, Trump accepted President Halimah Yacob‘s invitation to make a State Visit to Singapore in November 2018, in conjunction with the 6th ASEAN-US Summit and 13th East Asia Summit. A working-level meeting was held between the United States Ambassador to the Philippines Sung Kim and Vice Minister of Foreign Affairs Choe Son-hui, at The Ritz-Carlton Millenia Singapore on Monday morning. The meeting lasted over two hours and was believed to further work out the details of the summit between Trump and Kim and to push forward their agendas. Meanwhile, North Korea’s Minister of Foreign Affairs Ri Yong-ho met with his Singaporean counterpart Vivian Balakrishnan on Monday morning too. After meeting Singapore’s Prime Minister, Trump and Secretary of State Pompeo met and thanked the team at the United States embassy in Singapore and Task Force 73 at Shangri-La Hotel. Trump then discussed the summit with South Korea’s President Moon Jae-in in a 40-minute phone call, expressing that he is willing to take “bold decisions” while Moon said that South Koreans are praying for Trump to “create a miraculous result”.He also spoke with Japan’s Prime Minister Shinzō Abe on the phone. Secretary of State Mike Pompeo gave a press briefing at the White House press room set up at the JW Marriott Hotel Singapore South Beach Hotel on Monday afternoon. He mentioned details of the preparations done by the US delegation and that the US is willing to offer North Korea security guarantees in exchange for the denuclearization of the Korean Peninsula. A South Korean official spoke at a closed-door press briefing held at South Korea’s Korea Press Center, confirming that Moon Jae-in will not travel to Singapore to attend the summit, despite earlier speculations. Instead, South Korea sent a delegation to Singapore to monitor the summit. Kim visited several of Singapore’s attractions in the Central Area together with his sister, Kim Yo-jong, on Monday evening. They visited the Flower Dome at Gardens by the Bay, the Jubilee Bridge, and the Marina Bay Sands integrated resorts. They were accompanied by Singapore’s Minister for Foreign Affairs Vivian Balakrishnan and Minister for Education Ong Ye Kung, the same ministers who welcomed him at Changi Airport the previous day. Retired U.S. basketball star Dennis Rodman, who made a number of visits to North Korea to promote sports and developed a personal relationship with Chairman Kim over several years, announced that he would be in Singapore during the summit but would not be involved in the meeting. Rodman arrived the day before the summit. The basketball star broke down in tears live on CNN as he recounted the hostility he faced for meeting Kim Jong-un. The summit was broadcast in real-time internationally. United States President Donald Trump arrived at Capella Hotel first before North Korean leader Kim Jong-un arrived seventeen minutes later. They started the summit at 9:05 am local time with a 12-second handshake and then participated in a one-on-one meeting, with interpreters only. Trump and Kim emerged from the one-on-one talks and walked down the corridor to the Cassia where the expanded bilateral meeting took place. Trump described the one-on-one meeting as “very very good” when asked by a reporter. When Trump was asked if he had notes of the one-on-one meeting to refer back and verify, Trump replied, “I don’t have to verify because I have one of the great memories of all time”. Both countries’ delegations proceeded to participate in an expanded bilateral meeting and a working lunch. Both delegations dined together on Korean, Southeast Asian and Western dishes with ice cream, tropézienne, and dark chocolate tartlet ganache as dessert. After the lunch, Trump and Kim took a short walk together and viewed the interior of the presidential state car. Subsequently, Trump and Kim signed a joint statement, titled “Joint Statement of President Donald J. Trump of the United States of America and Chairman Kim Jong-un of the Democratic People’s Republic of Korea at the Singapore Summit”, which Trump described as a “very important” and “comprehensive” agreement. The United States and the DPRK commit to establish new U.S.-DPRK relations in accordance with the desire of the peoples of the two countries for peace and prosperity. Reaffirming the April 27, 2018 Panmunjom Declaration, the DPRK commits to work towards the complete denuclearization of the Korean Peninsula. The United States and the DPRK commit to recovering POW/MIAremains including the immediate repatriation of those already identified. In addition to the numbered provisions, the joint statement also mentions Trump’s commitment to providing security guarantees to North Korea. Follow-up negotiations between Pompeo and an undetermined high-level North Korean official are also called for by the joint statement. Trump held a news conference at 16:15 local time which lasted for more than an hour. In his news conference, Trump said that further discussions will take place with North Korean officials and that he would consider visiting Pyongyang.Referring to his commitment in the Joint Statement to “provide security guarantees” to North Korea, Trump announced the end of the joint military exercises with the South Korean military, which he described as “provocative”. U.S. Forces Korea and South Korea were apparently not consulted. He expressed his hope that the removal of 32,000 American troops defending South Korea would become part of the equation. The next round of joint military exercises was scheduled for late August. On June 12, Trump left Singapore from Paya Lebar Air Base at around 18:30 local time, earlier than his planned departure time of 19:00 while Kim Jong-un left Singapore from Changi Airport at around 22:30. In October 2018, a second North Korea–United States summit was announced. The summit received a mixed international reaction, with many countries expressing praise or hope for achieving a peace deal from the summit. Some commentators expressed skepticism towards the signed agreement, pointing to a history of failed past agreements and to the vague wording of the declarations. China raised the possibility of sanction relief following the summit, but Pompeo said sanction relief would only be granted after complete denuclearization. Joint-military exercises between the United States and South Korea were halted, a demand that North Korea had long made. Visitors to North Korea reported that anti-American posters, postcards, stamps and similar items were no longer sold in tourist shops. On June 9, two South Korean media personnel from South Korean broadcaster KBS News were arrested for trespassing at the home of the North Korean ambassador in Singapore. KBS News subsequently issued an apology for not being cautious. The two media personnel were deported the next day on June 10. On June 11, five South Korean women were arrested on Monday night for protesting outside the St. Regis Hotel where Chairman Kim and his delegation were staying. The police warned the women for violating the Public Order Act but they refused to cooperate, leading to their arrests. The media source 38 North, an American agency which monitors North Korea, told CNN that only two small roof buildings had been newly erected, which might be used for hospitality roles for senior officials or nuclear inspectors. Other improved infrastructures were already developed before the Trump-Kim Summit. On June 30, NBC reported that, according to an assessment by the U.S. intelligence agencies, North Korea might have increased production of fuel for nuclear weapons at multiple secret sites after the summit, though if the process of enrichment had occurred, it must have begun before the summit. On August 3, experts monitoring U.N. sanctions against North Korea sent a report to the UN Security Council saying North Korea “has not stopped its nuclear and missiles programs” and is still violating sanctions by transferring coal at sea and flouting an arms embargo and financial sanctions. However, North Korean Foreign Minister Ri-Yong Ho said in a privilege speech at the ASEAN summit, that a “good-faith implementation of the Joint Statement (between the USA and DPRK) would be necessary”. Referring to this same speech, the North Korea monitoring specialist Group, 38 North, believes that in order to achieve the goal to denuclearize, a scheme of ALL TAKE-NO GIVE will never work with DPRK. CNN acquired satellite images in December 2018 that indicated North Korea was continuing to significantly expand a major long-range missile site in the mountainous interior of the country, including an “extremely large underground facility” that was under construction as of August 2018. The director of USC Korean Studies Institute David C. Kang wrote an analysis of North Korea’s solution which was published in the New York Times. Writing that the Trump administration should proceed with the necessary action items of U.S. side in order to ask North Korea to give up their Nuclear Weapons, Kang emphasized that unilateral disarmament of the DPRK would be impractical, and that a “phased” and “synchronous” approach with “step by step” negotiations would be a more reasonable way forward, with respect to the US-DPRK Joint Statement signed at the Singapore summit. The DPRK has shown eight or more types of various actions on their portion of the agreement; a moratorium on missile/nuclear tests, dismantling the Sohae atomic test and satellite launch site, the shutting down of an intercontinental ballistic missile assembly facility near Pyongyang, the returning of the remains of 55 U.S. Soldiers killed in the Korean War, the removal of domestic anti-American propaganda, and the release of three American Citizens arrested and imprisoned in the DPRK, as North Korean action items of the summit. However, the US has thus far taken only one action; the cancelling of joint military exercises between the US and South Korean Air Forces in the peninsula. If the United States should complete more of its action items under the Singapore agreement, with regard to North Korea’s security concerns, the North Korean government in turn may be willing to make further actions toward denuclearization. North Korean minister Ri Yong-ho has claimed that the US is backtracking or has made no progress on the American side of the Singapore Summit agreement, while saying that North Korea itself has taken some measures including the cessation of nuclear and missile testing, along with the removal of a primary nuclear site. US Secretary of State Mike Pompeo has made a request for North Korea to hand over 60 to 70 percent of its nuclear arsenal within six to eight months. However, the DPRK has not yet accepted that proposal. The North Korean foreign minister released an announcement criticizing unilateral denuclearization, and Ri Yong-ho has emphasized that it is only equitable to perform a “balanced, simultaneous, step-by-step implementation” of the US-DPRK Joint Statement. There are four action items in the Joint Statement, the first and second items being the renewal of North Korea–United States relations, the third item being the denuclearization of the Korean Peninsula, and the final item the recovery of American POW/MIA remains from the Korean War. Currently, there are still three American nuclear capable jets stationed in South Korea. Additionally, North and South Korea, still lacking a proper peace treaty, are still technically at war. The DPRK urged the US to guarantee the DPRK’s security by a formal declaration of the ending of the Korean War, in exchange for the DPRK ending its nuclear program and forfeiting its nuclear weapons. Doug Bandow, a special assistant to former President Ronald Reagan, suggested that the US provide the DPRK with a safety framework in the form of a peace treaty, in exchange for the DPRK ending their nuclear program. DPRK removed the anti-American propaganda after the Singapore summit, and Pyongyang cancelled the annual ‘anti-US’ rally event that year. During the 2017 protest that was held in Kim Il-sung Square, it was reported 100,000 people had attended the occasion. On July 6–7, Pompeo travelled to North Korea for the third time to continue the negotiations with General Kim Yong-chol, Kim’s right-hand man. After the meeting, Pompeo stated that the talks had been productive and that progress had been made “on almost all of the central issues”. However, the North Korean state media criticized the meeting soon after, saying the U.S. had shown a “gangster-like attitude” and calling the demands of the Trump administration “deeply regrettable”. Notwithstanding the stern reports, Pompeo delivered a letter from Kim to Trump, in which the latter expressed his hope for successful implementation of the US-North Korea Joint Statement and reaffirmed his will for improving the relations between the countries. Pompeo announced on August 23, 2018, that he would return to North Korea the following week for the fourth round of talks. The following day, Trump tweeted that he had asked Pompeo not to make the trip because he felt “we are not making sufficient progress with respect to the denuclearization of the Korean Peninsula.” Concerning the cancellation of Pompeo’s planned North Korea trip, Vox summarized the background based on the reports by the Washington Post and CNNthat North Korea delivered an irate letter to Pompeo and the letter was shown to Trump in the Oval Office on Friday, and Trump tweeted the cancellation of Pompeo’s trip. The message from DPRK was North Korea’s evident disappointment as Washington had shown no real eagerness to sign a peace treaty to end the Korean War. S. Korean Foreign Minister Kang Kyung-wha urges continued U.S.- DPRK talks despite Trump’s cancellation of Pompeo trip. Kang spoke to Pompeo by telephone on 25 August, and expressed concern over the cancellation of the trip while calling for continued discussions on peace and resolution of North Korea’s nuclear program. Kang also stated “it is more imperative to concentrate diplomatic efforts on the faithful fulfilling of what has been agreed in the 2018 Trump-Kim and the inter-Korean summit while sustaining the energy for talks on the long-term standpoint”. Japanese Foreign Minister Taro Kono revealed appreciation for Pompeo’s “prompt communication” with South Korea, and Japan would be pleased to cooperate with the U.S. for denuclearization of the Korean Peninsula. After the Trump-Kim summit, North Korea searched for and returned the remains of U.S. POWs and MIAs from the Korean War. The remains of US soldiers in DPRK start the journey to the U.S. after 65 years. The US war remains were delivered from the eastern DPRK city of Wonsanby U.S. military transport plane C-17 Globemaster to the Osan Air Basenear Seoul in South Korea. On June 27, Pompeo said North Korea was planning to hand over presumed remains of U.S. soldiers killed during the Korean War in the near future. In preparation, the U.S. military had moved 158 metal coffins through the DMZ border between North and South Korea one week earlier. Following Pompeo’s second visit to Pyongyang, a lower ranks meeting took place on July 15 regarding the retrieving of remains of US soldiers from the Korean War. Pompeo called the talks “productive” and said the two sides had reached firm commitments on the issue. On July 27 North Korea handed over 55 boxes of human remains, thus starting to fulfill their pledge in the Singapore declaration. The remains were saluted in a ceremony in their honor by US soldiers. More than 36,000 American troops died during the Korean War, but some 7,700 remains unaccounted for, including 5,300 believed to have died in North Korea. Earlier, 220 remains were recovered during the years 1996-2005. North Korea reported to the U.S. Defense POW/MIA Accounting Agency that they couldn’t be sure how many individuals were represented in each of the 55 boxes. There was uncertainty about the nationality of the war remains, whether the individuals were American or from other countries that took part in the Korean War, such as Australia, Belgium, France. and the Philippines. Kelly McKeague, the director of the POW/MIA Accounting Agency, said a preliminary review showed that the remains are “consistent” with being American and are from the Battle of Chosin Reservoir. The next phase would be matching the dental records, x-rays and DNA testing to further analyze the remains for possible identification. McKeague expressed his opinion that North Korea needs to allow the resumption of joint U.S.-North Korean searches of battlefields and POW camp graveyards to discover more war remains as soon as practical. North Korea dismantled the various significant parts and permanent structure of the Sohae ICBM missile & Satellite Launching Station. The DPRK Government had begun to dismantle an ICBM rocket launching and testing engine site to demonstrate its commitment to denuclearization. CBS News has identified the site as the freshest of North Korea’s recognised major missile testing facilities. On July 24, it was reported that North Korea had begun to dismantle a rocket launching and testing site near Tonchang, an action which Kim had pledged to Trump. South Korean President Moon called the move “a good sign for North Korea’s denuclearization”. The North Korea monitoring specialist group 38 North found that the Sohae Station, a satellite-launch site in North Korea, was being demolished. Satellite imagery shows that several significant structures were destroyed: a missile-launching stand and a building near a launchpad for satellites. 38 North suggested that it is an essential beginning step towards achieving a commitment made by Kim Jong Un at the June 12 Singapore Summit. On 7 August, there is more progress on Dismantling Facilities at the Sohae Satellite and Missile Launching Station. it entails the demolition of the test stand’s concrete foundations, launch pad’s gantry tower and pad foundation, etc. While the previous dismantlement of the vertical engine test stand on 23 July, represents a fulfilment of Chairman Kim’s arrangement with President Trump conducted publicly during the post-Singapore Summit press conference, activity at the launch pad and concrete foundation appears to go exceeding that pledge. These activities, however, must be viewed cautiously as “principal steps” since neither are presently permanent or irreversible. Concerning 38 North’s scrutiny, it would characterize more durable and irreversible actions as there is no identified facility with equivalent capabilities elsewhere in the DPRK. In August, during the ASEAN Regional Forum 2018, North Korea’s nuclear program was the critical agenda item. ASEAN forum foreign ministers issued a joint statement calling for a “complete denuclearization” which is the same phrase used in the joint statement issued after the summit, and represents a change from last year’s call for a “complete, verifiable and irreversible denuclearization”. South Korea’s Foreign Minister Kang Kyung-wha has said that she had “considerable” consultations over the issue of the declaration to a formal end of the 1950-53 Korean war with the Chinese and U.S. foreign ministers. Chinese Foreign Minister Wang Yi said “everyone can announce a declaration ending the war if they do not want the war to happen again”. North Korean Foreign Minister Ri Yong Ho said he was “alarmed” by U.S. insistence on maintaining sanctions until North Korea denuclearizes and what he said was U.S. reluctance to declare a formal end to the Korean War. United States Forces in Korea maintains several nuclear bomber fighters and DPRK is demanding USA safety guarantee for giving up nuclear weapon programs of Pyongyang. On October 7, 2018, U.S. Secretary of State Mike Pompeo and Kim met in Pyongyang and agreed to a second U.S.–North Korea summit, with South Korea’s presidential office stating that it would take place “as soon as possible.” It is unknown at this time when the second summit will take place. However, Pompeo stated it would happen “soon” and that details have been revealed to South Korean President Moon Jae-In during a meeting in the South Korean capital of Seoul.During the State of the Union Address President Trump announced Vietnam to host the second meeting between the two leaders. According to President Trump, this summit will be held in Vietnam on February 27–28, 2019. On February 8, 2019, President Trump announced that Hanoi will host the summit meeting. For the 2018 Trump-Kim summit, see 2018 North Korea–United States Singapore Summit. The White House on Thursday, February 28, 2019, announced that the summit was cut short and that no agreement was reached. President Trump said in a press conference after the summit in Hanoi that the summit was cut short because North Korea wanted an end to sanctions. President Trump elaborated by saying “Basically, they wanted the sanctions lifted in their entirety and we couldn’t do that,” Trump said. “We had to walk away from that particular suggestion. We had to walk away from that.” The unexpected turn of events caused stocks on the South Korea stock exchange to fall.The 2019 North Korea–United States Hanoi Summit, officially the DPRK–USA Hanoi Summit Vietnam, or commonly known as Hanoi Summit, was a two-day summit meeting between North Korean Chairman Kim Jong-un and U.S. President Donald Trump, held at the Metropole Hotel in Hanoi, Vietnam, on February 27–28, 2019. This was the second meeting between the leaders of the North Korea and United States, following the first meeting in June 2018 in Singapore. The first North Korea–United States summit took place in June 2018 in Singapore in order to overcome the long-term Korean conflict with ICBM nuclear weapons and denuclearize the Korean peninsula. Series of bilateral summits were held between North Korea’s Kim Jong-un, China’s Xi Jinping, South Korea’s Moon Jae-in, and Donald Trump of the United States. The White House gave confirmation of the planned summit between North Korean Chairman Kim Jong-un and U.S. President Donald Trump on September 11, 2018. U.S. Secretary of State Mike Pompeo stated that the DPRK and U.S. were ‘working diligently’ to make sure the conditions were right for the summit. Trump announced the host country, Vietnam, and the dates, February 27–28, during his second State of the Union Address on February 5, 2019. On February 8, 2019, President Trump announced that Hanoi, Vietnam would host the summit meeting. Vietnamese Deputy Prime Minister and Foreign Minister Phạm Bình Minh visited North Korea at the invitation of DPRK Foreign Minister Ri Yong-ho from February 12-14. The visit came ahead of the summit between WPK ChairmanKim Jong Un and US President Donald Trump planned to take place in Hà Nội, Vietnam, on February 27 and 28, a spokeswoman from the Vietnamese Foreign Ministry said in a statement posted on Twitter. In reply to a question for Vietnam’s comment on Trump’s remarks in his latest State of the Union address on the upcoming summit, Foreign Ministry Spokesperson Lê Thị Thu Hằng said Vietnam welcomed the second DPRK-USA summit and strongly supported dialogue to maintain peace, security, and stability on the Korean Peninsula. Vietnam stood ready to actively contribute to and cooperate with both sides to ensure the success of the second DPRK-USA summit, helping to achieve the above-mentioned goal, the official said. Secretary of State Mike Pompeo appointed Stephen Biegun as United States Special Representative for North Korea on August 23, 2018. In November 2018, North Korea repeated its demand that American economic sanctions on the country be lifted as a condition of proceeding in talks, while the Trump administration continued to insist North Korea make concessions first. Meetings between Secretary of State Mike Pompeo and North Korean officials were scheduled, canceled due to disagreements, then rescheduled. The February 2019 summit was confirmed after Kim Yong Chol, North Korea’s top negotiator, met with Trump in the Oval Office on January 18, 2019. Top American intelligence officials testified to Congress in January 2019 that it was unlikely North Korea would fully dismantle its nuclear arsenal, and Trump national security advisor John Bolton continued to believe North Korea could not be trusted and denuclearization efforts would fail. Trump has asserted that North Korea’s pause of weapons testing since the Singapore summit was a sign of progress, but Bruce Klingner of the Heritage Foundation noted there had been longer testing pauses during previous administrations. Going into the summit, wide gaps persisted between the two countries, including exactly what “denuclearization” means. In January, Biegun had repeated the official American stance that sanctions on North Korea would not be lifted until the country had fully denuclearized. On January 31, 2019, Biegun indicated that American negotiators might not demand that North Korea provide a full inventory of its nuclear and missile programs as a first step toward denuclearization, a demand that North Korea had been resisting. On September 26, 2018, CNN reported that Mike Pompeo was to travel to North Korea to organize the second summit between President Trump and North Korea’s chairman Kim Jong-un. On October 7, 2018, Pompeo traveled to Pyongyang to negotiate with Chairman Kim Jong-un. Both agreed to a second U.S.–North Korea summit. 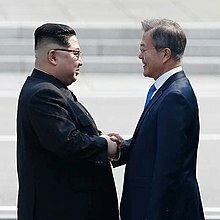 While discussions are still ongoing to determine the timing and location of this second summit, South Korea’s presidential office stated that it would take place “as soon as possible.”Pompeo also issued a statement where he claimed that his latest trip to Pyongyang was “another step forward” to denuclearization in the Korean peninsula and he also had a “good, productive conversation” with Kim, though there was still more work which needed to be done. The same day, Pompeo traveled to the South Korean capital, Seoul, where he held talks with Moon. Pompeo afterwards stated that details of his meeting with Kim were revealed to Moon, but that they were currently classified so that the South Korean government would be the only third party with firsthand knowledge. He also stated that the summit would happen “soon”. On January 8, 2019, Kim Jong-un made his fourth visit to meet Chinese leader Xi Jinping to consult with him on the possibility of the Kim–Trump summit in Vietnam. On 13 January 2019, Pompeo said details were being worked out for a second U.S.-DPRK summit. On January 14, 2019, the South Korean newspaper Chosun Ilbo reported that Pompeo would hold talks with North Korea January 17 or 18. On January 18, 2019, according to the Wall Street Journal, The White House announced that President Trump and North Korean chairman Kim Jong-un will meet for the second time in February. On January 30, 2019, Pompeo said a team is heading to Asia for the second Trump–Kim summit. North Korea and the United States reportedly to hold working talks at Panmunjom around February 4. On January 31, 2019, President Trump said a time and location for summit with North Korean chairman Kim Jong-un has been set, and said they would be announced next week. On February 5, 2019, President Trump announced during his State Of The Union address that the summit will take place on February 27–28 in Vietnam; however, he did not reveal in what city it will take place. On February 10, 2019, Bloomberg reported that the United States and North Korea will resume talks in the week of February 17. On February 11, 2019, South Korean Yonhap News Agency reported that Vietnam’s top diplomat would visit North Korea from February 12–14 ahead of the second meeting between the two leaders. On February 16, 2019, Reuters reported that North Korean chairman Kim Jong-un will arrive in Vietnam on February 25 ahead of the summit. The State Department special representative to North Korea, Stephen Biegun, is heading to Pyongyang on Wednesday[when? ]to solidify some details related to the summit, including the city where it will take place. He will also press for the North Korean counterpart to attend a series of working level meetings before the summit. With the summit just three weeks away, follow-up meetings at a working level will be needed, especially as there was no progress on denuclearization during the last visit by a North Korean delegation to Washington, in January. The North Koreans have also said that they would take steps on denuclearization if the U.S. takes corresponding measures, though Biegun said last week that one of his tasks will be to figure out exactly what that means, though this most likely means the easing of sanctions. Regarding the release from Bloomberg and the South Korean newspaper Munhwa Ilbo anticipated the location of the second Trump–Kim Summit as Vietnam’s capital city, Hanoi, because Vietnam is a long-standing partner of DPRK, and there is also an excellent foreign relationship between Vietnam and the US. During the 2019 State of the Union Address, President Trump announced Vietnam as the host of the second meeting between the two leaders. There was a list of several cities that were considered potential to host this event. It includes government direct-administered cities (Hanoi, Đà Nẵng, Hồ Chí Minh City) and some other places like Hạ Long, Nha Trang, Phú Quốc. However, Hanoi is said to be the brightest candidate for many reasons, such as being presented with the title “City for Peace” by the UNESCO, being the capital of Vietnam, and being a favorable place for Vietnamese leaders to meet DPRK leaders and USA leaders. It was reported that when the city in Vietnam was still being discussed, the main contenders were Hanoi (favored by North Korea because it has its Embassy there) and Da Nang (favored by the United States because the 2017 APEC Vietnam summitwas held there). On February 8, 2019, President Trump confirmed that Hanoi, Vietnam will host the summit meeting. DPRK officials have repeatedly investigated the Government Guesthouse and the Sofitel Legend Metropole Hanoi, Hanoi’s first international hotel. The summit was held at Metropole Hotel in Hanoi. President Trump met Vietnamese President and General Secretary Nguyễn Phú Trọng around at 11:42 am local time. They watched the Vietnamese airline executives signed a series of business deals with U.S. companies. Some example contracts were that VietJet Aviation JSC announced it would acquire 100 Boeing Co. 737 MAX aircraft, and also signed an agreement to purchase engines and maintenance services of General Electric. Bamboo Airways signed a deal to buy 10 Boeing 787-9aircraft. At Hanoi’s Metropole Hotel, Trump and Kim had a one-and one meeting for 30 minutes on Wednesday evening. They started the summit at 6:30 pm local time(6:30am Eastern Standard Time) with a handshake and then participated in a one-on-one meeting, with interpreters only. President Donald Trump and Chairman Kim Jong-un started with a social dinner in Hanoi on Wednesday. There were a few key attendances of the dinner; seated at the round table was U.S. Secretary of State Mike Pompeo and acting Chief of Staff Mick Mulvaney, DPRK Vice Chairman Kim Yong-chol, and Minister of Foreign Affairs Ri Yong-ho. President Trump assured North Korea a “tremendous future for your country” in his initial speeches with chairman Kim Jong-un. Chairman Kim described the second summit a “courageous political decision” by Trump and also added that there had been “a lot of thinking, effort, and patience” between now and previous June summit in Singapore. BBC News believed that DPRK Chairman Kim Jong-un could potentially learn from Vietnam’s social, political, and economichistory. during the second Trump-Kim summit. While the country has strict rules against political liberalization, it is fairly lax in their social, religious, and economic guidelines. Citizens were able to travel to neighboring countries often. Vietnam also pursued multi-front foreign policies so they would not be dependent on just one economy and built modern systems for banking and finance. According to the BBC, the DPRK can also learn from Vietnam’s mistakes in the past regarding managing their natural resources and handling political unrest. The BBC believes these are some cases the DPRK could learn from Vietnam’s practice to help them in improving their economy by attracting foreign investors and developing closer relations with other countries. It is also assumed by the BBC that Vietnam’s economic reform is a better pattern for the DPRK to follow than China‘s. Al Jazeera assumed that the impact of China on the second Trump-Kim summit would be significant. The relationship between China and North Korea is centered on “mutual benefit” but it’s differs from “mutual trust”. Australian professor Carlyle Thayer claimed China and the DPRK are of the corresponding inclination after Kims’ four visits to China and “It indicates some kind of coordination.” China believes that it is impossible for North Korea to abruptly destroy nuclear missiles. However, it is hoped that North Korea’s nuclear missile program will be shut down gradually, as economic sanctions against North Korea will be eased. The Sydney Morning Herald reported that Kim’s previous propaganda was changed into patriotism and economy, and in improving the relationship between the United States, China, and South Korea.